Problem addressed Family physicians provide most of the care for the frail elderly population, but many challenges and barriers can lead to difficulties with fragmented, ineffective, and inefficient services. Objective of program To improve the quality, efficiency, and coordination of care for the frail elderly living in the community and to enhance geriatric and interprofessional skills for providers and learners. Program description The Seniors Collaborative Care Program used an interprofessional, shared-care, geriatric model. The feasibility of the program was evaluated through a pilot study conducted between November 2008 and June 2009 at Stonechurch Family Health Centre, part of the McMaster Family Health Team. The core team comprised a nurse practitioner, an FP, and a registered practical nurse. Additional team members included a pharmacist, a dietitian, a social worker, and a visiting geriatrician. Twenty-five seniors were evaluated through the pilot program. Patients were assessed within 5 weeks of initial contact. Patients and practitioners valued timely, accessible, preventive, and multidisciplinary aspects of care. The nurse practitioner’s role was prominent in the program, while the geriatrician’s clinical role was focused efficiently. Conclusion The family health team is ideally positioned to deliver shared care for the frail elderly. Our model allowed for a short referral time and easy access, which might allow seniors to remain in their environment of choice. Integration, long established between primary care and mental health services,8,9 has recently become an important theme in health reform for care of the elderly. Little is known about how teams function in these models. Although primary care clinicians are important stakeholders, and it has been argued that successful integration must be initiated or led by primary care providers,7 there is limited understanding of this perspective in the context of integrated care for seniors. This paper describes an interprofessional, integrated geriatric program within an FHT and includes a preliminary evaluation from the perspective of primary care providers and their patients. The Seniors Collaborative Care Program (SCCP) began as a pilot program at the Stonechurch Family Health Centre (SFHC) in 2008 and continues to operate. The SFHC is part of the McMaster FHT of the Department of Family Medicine at McMaster University in Hamilton, Ont. The SFHC serves 15 204 patients including 737 seniors older than 75 years of age. The composition of the McMaster FHT has been described elsewhere.10 Each SCCP core team consists of 1 nurse practitioner (NP) (who dedicates 0.35 full-time equivalent [FTE] hours to the team), 1 FP (0.10 FTE), and 1 registered practical nurse (RPN) (0.05 FTE). Additional SCCP members include a pharmacist, a social worker, a dietitian, and a visiting geriatrician. The goals of the SCCP were to improve the quality, efficiency, and coordination of care for frail elderly patients living in the community, and to enhance geriatric and interprofessional skills for SFHC practitioners and learners. The objectives of the pilot project were to determine the feasibility of the new model to learn what would work and what resources would be required, and to understand team roles and the integration of a geriatrician. The pilot study was conducted between November 2008 and May 2009. A case-finding strategy was used to identify seniors at risk of cognitive impairment or falling. These conditions were chosen to identify patients who could most benefit from multidisciplinary approaches to care. The pilot program emphasized providing care in the homes of housebound seniors, which is a less prominent aspect of usual care at the SFHC. When identified needs exceeded the scope of the FP, NP, or RPN, other SCCP members were accessed. For example, when medication risks were identified, a request for pharmacist assessment was made. For diagnostic clarification or advice with challenging management strategies, a visiting geriatrician was involved. The geriatrician attended regular monthly, case-based team meetings with the SCCP team and other SFHC learners and practitioners involved with care. The geriatrician provided consultation to the team and direct care as deemed necessary by the team. As with initial assessments, visits with any provider, including the geriatrician, could occur at the SFHC or in the patient’s home. Team plans were communicated and implemented, and follow-up arrangements were negotiated among the SCCP, the patient’s main care team, community care providers, caregivers, and patients. Figure 114–17 shows patient flow through the pilot SCCP. NP—nurse practitioner, RD—registered dietitian, RPN—registered practical nurse, SW—social worker. This model offers numerous advantages. Coordinating care is easier because it remains within the patient’s family practice. It is facilitated by fast, effective communication among SCCP members and the patient’s main practitioners through internal electronic messaging embedded within the patient’s Web-based electronic medical record (EMR). Shared medication profiles contribute to prescribing safety and rational treatment. Teamwork is enhanced by bringing SCCP members together for case-based team meetings with access to EMRs, promoting uninhibited interactions and shared assignment of care plans. Another advantage is educational. The expertise of the geriatrician builds capacity within the team. When FPs have exhausted all their own resources, it is important that they receive team support quickly and easily. It is an ideal learning forum for SFHC practitioners, residents, and other health professional students. Team-based case meetings provide educational opportunities, emphasizing approaches to the “geriatric giants” of dementia, delirium, falls, incontinence, and polypharmacy as they converge with common chronic or degenerative conditions. Group problem solving stimulates creative and expanded options for patients and families, and provides an opportunity to appreciate each profession’s scope of practice. Learning opportunities are bi-directional. The geriatrician learns about the challenges facing primary care practitioners when caring for frail elderly patients. Approval for this study was obtained from the Research Ethics Board of the Hamilton Health Sciences Faculty of Health Sciences. For the pilot study, seniors older than 75 years of age at SFHC were randomly assigned numbers using a random number generator to be contacted by telephone to evaluate their risk of cognitive impairment and falling. Table 1 summarizes telephone-screening results. Telephone screening questions to identify seniors at risk: Of 163 calls, contact was established with 114 seniors and 76 completed the telephone screen; of the 51 identified as at risk, 31 accepted the appointment for further review and 25 attended for evaluation. Characteristics of patients screened by telephone and recruited for the pilot phase: N = 25 (7 men and 18 women). 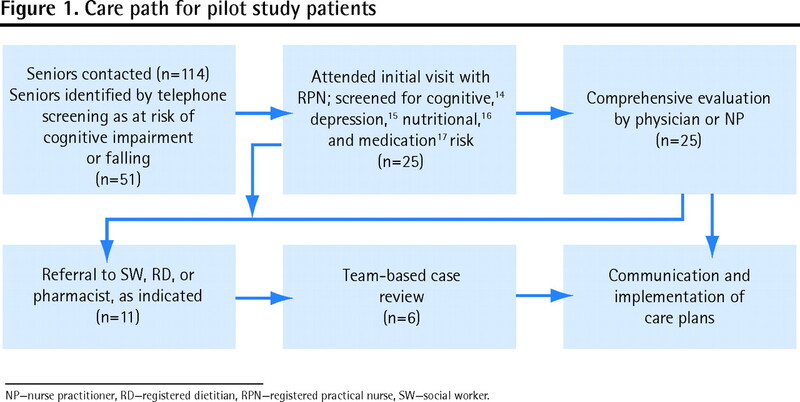 Table 3, showing time spent by SCCP members with direct and indirect pilot patient care, demonstrates the prominent role of the NP and the focused role of the geriatrician. Interviews were conducted to obtain opinions about the successes and limitations of the program. All pilot patients were invited to provide feedback approximately 2 weeks after the intervention. Six patients or caregivers consented to interviews. All 5 NPs and all 5 FPs attached to pilot study patients consented to interviews. A combination of Likert ratings and open-ended questions were used to determine satisfaction with the program. Interviews and open-ended responses were audiotaped, transcribed, and evaluated for thematic content. Patients, NPs, and physicians who provided feedback were highly satisfied with the program overall and agreed it was worthwhile for seniors (Table 4). Participants identified several common themes that made the program workable or that were benefits of involvement. For practitioners, the ease of access facilitated by short wait times and the flexibility to have services in patients’ homes were important. They also identified fast and effective communication among team members as contributing to program success. Several respondents commented on the benefits of multidisciplinary contributions that provided information and support from multiple perspectives. One of the most important factors identified was the preventive nature of the program, which in some cases included identification and elimination of home fire and falling hazards, food procurement problems, and caregiver exhaustion. Practitioners reported that identification of problems and potential hazards allowed the team to put plans in place quickly to prevent crises. As a result, it is possible that patients might have been able to be maintained at home rather than going into an institution, although this was not measured. Nurses and FPs appreciated the opportunities for SFHC learners, who are involved in all stages of care, to learn about a growing segment of the population for their future work. Although seniors expressed satisfaction with the program and found it worthwhile (based on Likert ratings), responses to open-ended questions indicated that they did not have sufficient recollection of the program to provide detailed commentary. Respondents reported confusion with defining roles and responsibilities between SCCP practitioners and the patient’s main care team (eg, who responds to telephone calls from patients and caregivers). Roles and expectations are now clarified during initial team meetings. Patients are no longer recruited by telephone, as this case-finding method is inefficient. The FPs and other allied providers at the SFHC now identify which seniors they require assistance with and refer them for any issue. Seniors are no longer screened for pilot-study inclusion criteria (risk of falling and cognitive impairment). Since completion of the pilot project, approximately 4 patients per month are now referred and reviewed. Table 5 summarizes the characteristics of these referred patients, which are similar to those of pilot study patients in terms of age and cognitive scores.14–17 The pilot study is too limited to make further comparisons between seniors identified by telephone screening and those referred to the program. The average wait time for referred patients is 32 days. As illustrated in Table 5,14–17 these patients are at high risk of medication complications and cognitive impairment, and are primarily referred for “cognition concerns” (51%) and “multimorbidity” (41%). Characteristics of referred patients reviewed by the SCCP since completion of the pilot phase: N = 67 (25 men and 42 women). Recruitment by telephone screening in this setting is inefficient. Seniors, particularly those at risk of falling, might have been reluctant to attend the clinic because recruitment was conducted during the winter. In the future, feedback from seniors will be sought immediately after care to avoid challenges with recall and to improve the feedback response rate. The NP role, which includes a case-coordination function, is prominent in the program. The geriatrician’s role is focused efficiently to provide team consultation or direct care for 25% of patients. The timeliness, accessibility, and multidisciplinary aspects of the program that were valued by practitioners and patients are aligned with overall program objectives. Successful collaborative integration, built on foundations of trust, is established through personal relationships that are facilitated by co-locating team members.7 Most integrated models do not incorporate the geriatrician at the primary care site,18–20 and communication between primary and secondary caregivers is generally indirect and does not synchronously involve the team and the most-responsible FP. Opportunities for bi-directional understanding between specialists and generalists are limited. In contrast, the SCCP model is distinguished from other models through regular monthly meetings that bring the geriatrician and primary care practitioners together for face-to-face discussion and shared planning. This process fosters relationships and enhances interprofessional and geriatric skills within the team and clinic. Practitioners in our study appreciated the opportunity to participate in this format that cultivates multidisciplinary approaches and provides direct access to the geriatrician. The small number of respondents limits this study. Further evaluation is required. Other practitioners within the SCCP and perspectives of learners will be sought. Program evaluation and clarification of roles within the team and clinic are ongoing. Compensation issues often impede integration.22 Geriatricians were not funded through the McMaster FHT during the study period. Applications to the Ontario Ministry of Health and Long-Term Care have resulted in contractual sessional funding, negotiated annually, for visiting geriatricians to the health team. The interprofessional primary care setting is ideally positioned to deliver integrated, shared care for the frail elderly living in the community. Our model, which incorporates the visiting geriatrician into the primary care setting, highlights the benefits of shared care, which is more closely aligned with the needs of elderly patients. It allows for a short wait time and easy access. Learners, practitioners, and vulnerable seniors will further benefit from opportunities provided by this service delivery model once roles are more clearly defined and sustainable funding challenges are addressed. A prospective, non-randomized controlled trial is planned to evaluate patient, practitioner, caregiver, and health system outcomes. We would like to thank David McCann, MD, FAASFP, CCFP, who recently passed away, for his friendship, dedication, and supportive and motivational contribution to this program and paper. This project was funded by the Department of Family Medicine at McMaster University and the Ontario Ministry of Health and Long-Term Care. Views expressed in this paper do not necessarily reflect those of the Ontario Ministry of Health and Long-Term Care. This paper describes an interprofessional, integrated geriatric program within a family health team and includes a preliminary evaluation from the perspective of primary care providers and patients. Patients were screened for depression, nutrition, and medication risks by a registered practical nurse. This was followed by a comprehensive geriatric assessment by an FP or nurse practitioner. Other team members were accessed as needed. Assessments were made in the clinic or in patients’ homes for housebound seniors. Practitioners, including the geriatrician, attended regular monthly, case-based team meetings. This model offered numerous advantages. Because care remained in the family practice, coordinating care was easier. It was facilitated by fast, effective communication through electronic medical records, shared medication profiles, and regular case-based team meetings, which also enhanced teamwork. The model also offered educational advantages. The expertise of the geriatrician built capacity within the team, and the program provided an ideal learning forum for practitioners, residents, and other health professional students. Cet article décrit un programme gériatrique intégré interprofessionnel au sein d’une équipe de santé familiale, et comprend une évaluation préliminaire du point de vue des soignants de première ligne et de leurs patients. Une infirmière auxiliaire diplômée a effectué un dépistage chez les patients concernant la dépression, la nutrition et les risques liés à la médication. Par la suite, une évaluation gériatrique complète a été effectuée par un MF ou une infirmière praticienne. Les autres membres de l’équipe, incluant un pharmacien, un travailleur social, une diététiste et un gériatre visiteur étaient appelés à participer au besoin. Les évaluations ont eu lieu à la clinique ou au domicile des patients confinés à la maison. Les médecins, y compris le gériatre, ont assisté aux rencontres mensuelles régulières de l’équipe portant sur les cas. Ce modèle offrait plusieurs avantages. Parce que les soins demeuraient à l’intérieur de la clinique familiale des patients, ils étaient plus faciles à coordonner. Cela était rendu possible par une communication rapide et efficace entre les membres de l’équipe par l’entremise des dossiers médicaux électroniques, du partage des profils de médication et des réunions régulières de l’équipe pour discuter des cas, qui favorisaient aussi le travail d’équipe. Ce modèle était aussi avantageux au plan éducationnel. L’expertise du gériatre a amélioré les habiletés au sein de l’équipe, et le programme offrait un forum d’apprentissage idéal pour les médecins, résidents et autres professionnels de la santé en formation. Drs Moore, Patterson, and Nair, Ms White, and Ms House, contributed to the concept and design of the program. Mr Kadhim-Saleh and Ms Brown contributed to data gathering and analysis. All authors contributed to the interpretation of the results, preparing the manuscript for submission, and providing final approval for publication. Population projections for Canada. Provinces and Territories 2009 to 2036. Ottawa, ON: Statistics Canada; 2010. Catalogue no. 91-520-X.
. Interdisciplinary care for older adults with complex needs: American Geriatrics Society position statement. J Am Geriatr Soc 2006;54(5):849-52.
. Comprehensive primary care for older patients with multiple chronic conditions: “nobody rushes you through.”. JAMA 2010;304(17):1936-43.
. Improving recruitment into geriatric medicine in Canada: findings and recommendations from the geriatric recruitment issues study. J Am Geriatr Soc 2006;54(9):1453-62.
. Primary care for elderly people: why do doctors find it so hard? Gerontologist 2002;42(6):835-42.
. Interprofessional care: a blueprint for action. Toronto, ON: Health Force Ontario; 2007. Available from: www.healthforceontario.ca/upload/en/whatishfo/ipc%20blueprint%20final.pdf. Accessed 2012 Jul 12.
. Models for integrating rehabilitation and primary care: a scoping review. Arch Phys Med Rehabil 2009;90(9):1523-31.
. After shared care: patients’ symptoms and functioning 3 to 6 months following care at a rural shared mental health care clinic. Community Ment Health J 2008;27(2):47-54.
. Shared mental health care. Canadian Psychiatric Association and College of Family Physicians of Canada Joint Working Group. Can Fam Physician 1999;45:2143-4, 2147, 2159-60.
. Interprofessional education in academic family medicine teaching units. A functional program and culture. Can Fam Physician 2009;55:901.e1-5.
. Quality indicators for the management and prevention of falls and mobility problems in vulnerable elders. Ann Intern Med 2001;135(8 Pt 2):686-93.
. Montreal Cognitive Assessment (MoCA). Administration and scoring instructions. Montreal, QC: Centre Diagnostique & Recherche Alzheimer; 2010. Available from: www.mocatest.org. Accessed 2010 Sep 22.
. Development and validation of a geriatric depression screening scale: a preliminary report. J Psychiatr Res 1982–1983;17(1):37-49.
. Validity and reliability of SCREEN II (Seniors in the Community: Risk Evaluation for Eating and Nutrition, version II). Eur J Clin Nutr 2005;59(10):1149-57.
. Self-administered medication-risk questionnaire in an elderly population. Ann Pharmacother 2003;37(7–8):982-7.
. Primary care clinicians evaluate integrated and referral models of behavioral health care for older adults: results from a multisite effectiveness trial (PRISM-e). Ann Fam Med 2004;2(4):305-9.
. Collaborative care management of late life depression in the primary care setting. JAMA 2002;288(22):2836-45.
. Geriatric Resource for Assessment Care of Elders (GRACE): a new model of primary care for low income seniors. J Am Geriatr Soc 2006;54(7):1136-41.
. Ten key principles for successful health systems integration. Healthc Q 2009;13(Spec no):16-23.